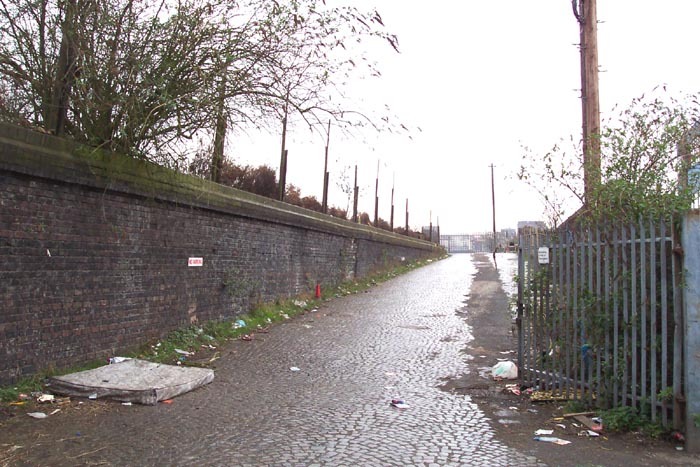 Bordesley station opened in 1855 on the GWR Birmingham to Oxford line between Snow Hill and Acocks Green (Small Heath and Tyseley not opening until some time later), a couple of minutes journey from the former. 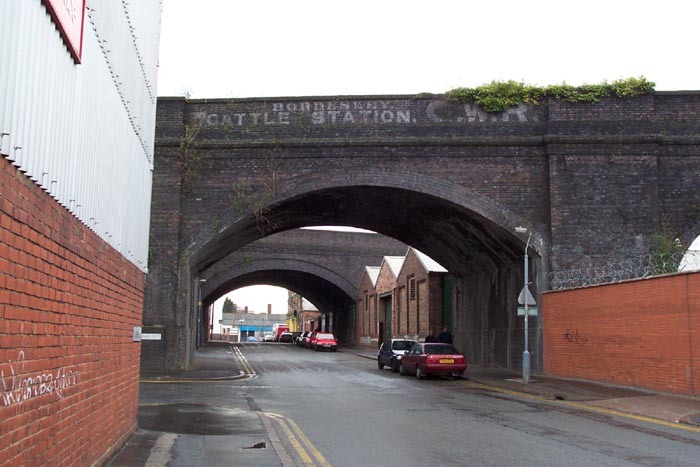 Built entirely on a viaduct, the station and assorted facilities were a significant structure housing a cattle station and goods yard along with the passenger station itself. 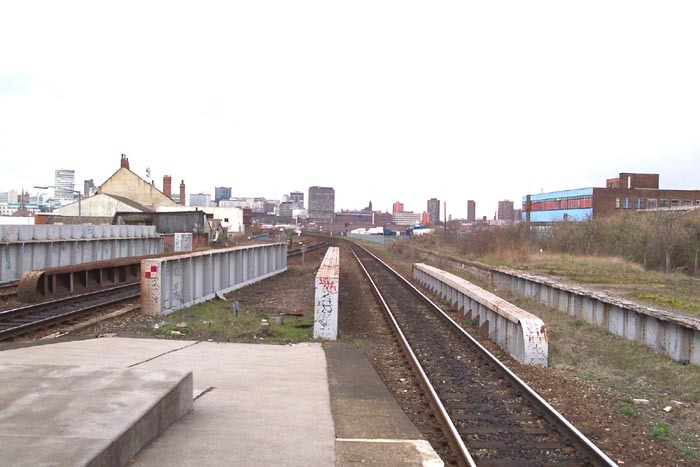 Unfortunately, the station has been considerably run down with all but one island platform remaining in use, what were significant canopied platform buildings removed, an extremely sparse timetable for stopping trains and the relegation of the station to an unstaffed halt. 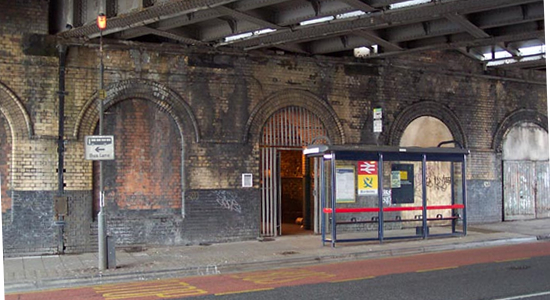 Above we see possibly the least inviting station entrance I have come across which is sited under a span of the viaduct which crosses Coventry Road near its junction with Bedford Road. Above-left we are standing in the doorway seen at the top of this page, looking-up the staircase that leads to the only functioning platform. Above-right we have climbed to the top of the stairwell and are looking back down it from platform level. 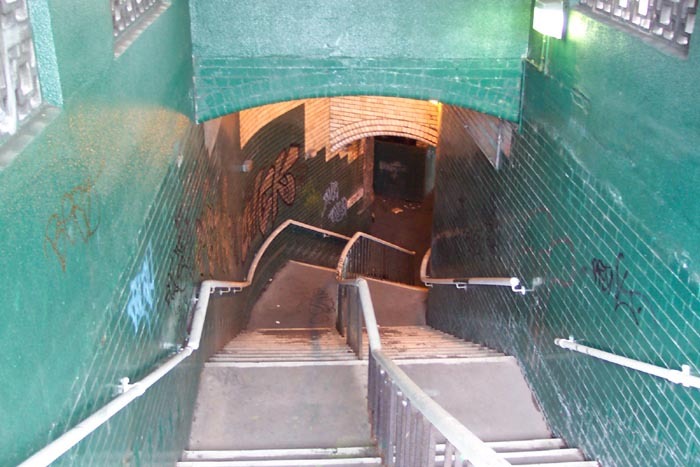 The stairwell is gloomy, graffiti-covered and if one closes their eyes, you could easily be mistaken for thinking you were in a urinal . . . not the most inspiring of starts to a visit! Above-left the top of the stairwell is to our immediate right and we are looking along the island platform towards Small Heath: at first impression the rest of the station is on a par with its entrance. However, a quick look around gives a few indications that the site has quite something to offer. 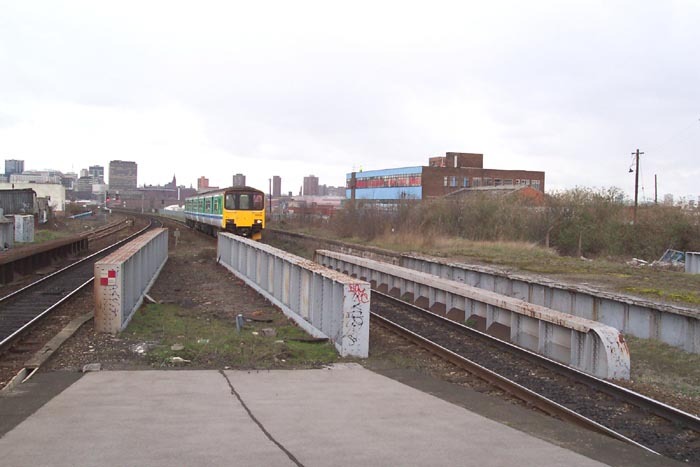 To the left is a disused, and falling apart, island platform which is heavily overgrown and missing its original buildings. 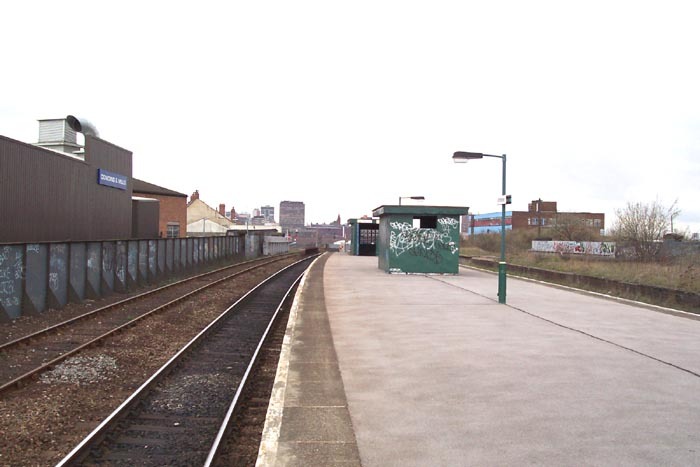 Above-right we have walked ahead to the other end of the platform and are looking back at the platform shelter (concrete bunker) and beyond it the stairwell entrance in the direction of Moor Street. Above-left we have turned to look towards Small Heath and the first signs of interest are apparent. 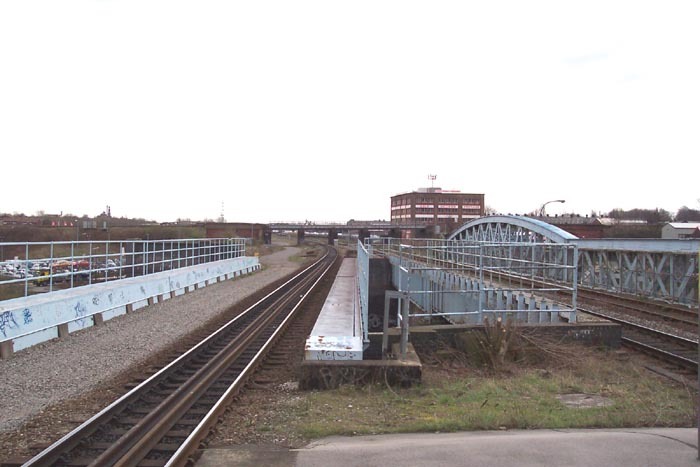 The 'bridge' structure crossing the line ahead carries the ex-Midland Railway's Camp Hill line over the GWR line and beyond that, although not easily apparent in the photograph, is Bordesley's goods yard which is marked by the large square building beyond the bridge that used to be a railway goods warehouse. 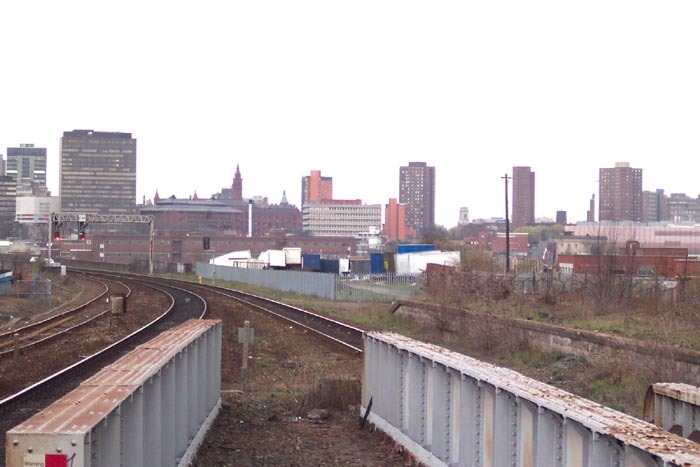 In the foreground is the top of a significant bridge over what was 'Sandy Lane' but is now 'Bordesley Middleway'. This is an impressive span and worth viewing from road level - I plan to revisit and will provide a photograph of this bridge when I do. 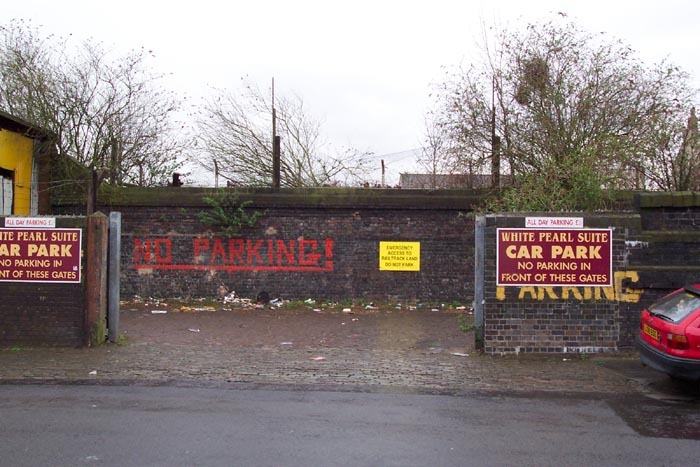 Above-right we have turned to face Moor Street again and this shot gives a good perspective on the width of the site, the now disused island platform to the right and the general air of despair about the place: note the severe amount of graffiti on the wall. 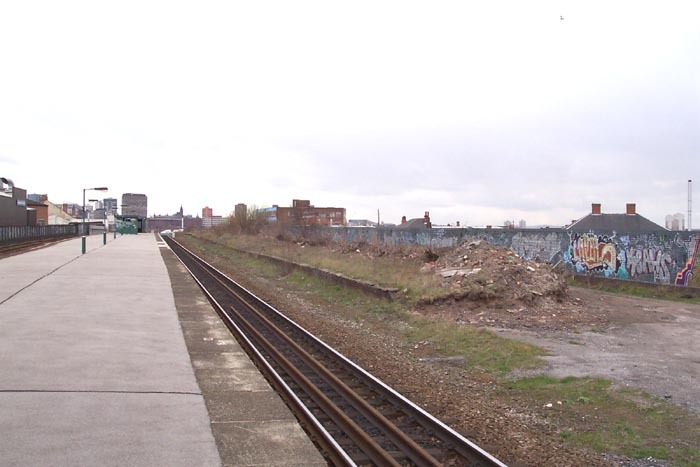 It is also apparent in this shot that the track has been reduced to one up and one down line - in this shot we see the line to Small Heath. 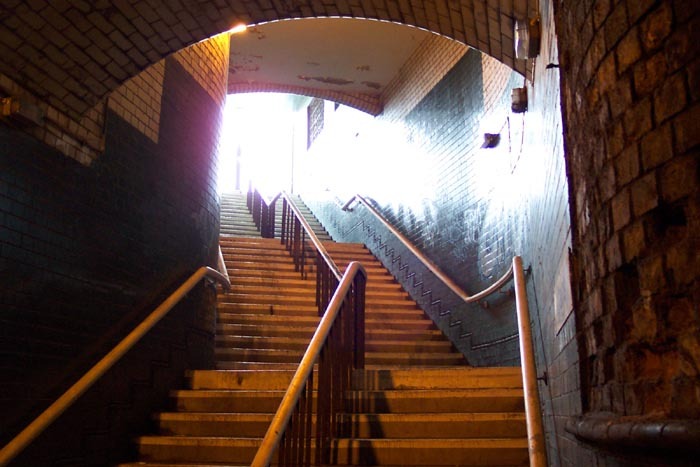 Above-left we are standing at the Moor Street end of the platform looking towards the City with the top of the entrance stairwell immediately to our rear. The supports in the foreground are above the Coventry Road. Above-right I thought it important to provide evidence that indeed trains do still operate here and was fortunate enough to see 150109 speed through the station. 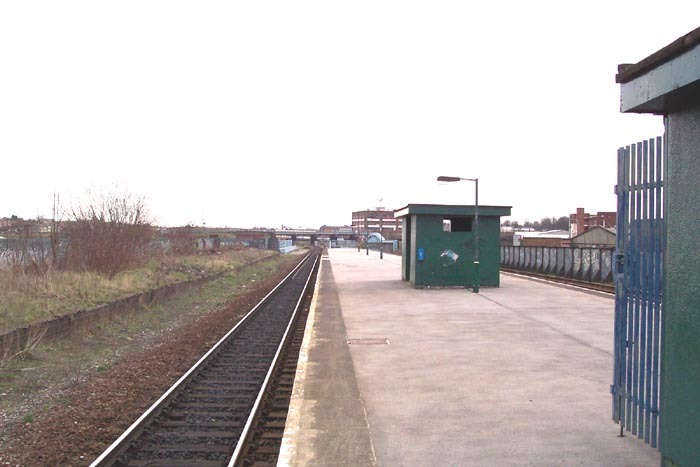 The station site becomes much more interesting when you leave the passenger platform and wander around its perimeter. Above-left we are on the corner of Coventry Road and Upper Trinity Street and this shot shows the direction sign for the cattle station once part of the site - the passenger station is behind and to the left of us. Above-right we have followed the direction of the sign along Upper Trinity Street and here we find the entrance to the cattle station. Above-left we have walked through the entrance gates and are looking up the driveway to the cattle station itself. Above-right we have reached the top of the driveway and are looking at the site of the cattle station (unfortunately a large metal fence prevents any further progress - the photograph is taken through the railings). 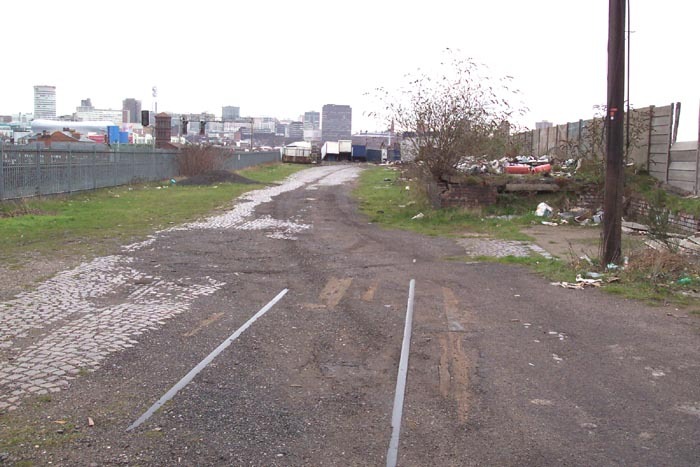 Remains of rails can clearly be seen in the foreground as can the cobbled yard. Straight ahead we see the point where the viaduct carrying the GWR line bifurcates: to the right is the ill-fated viaduct to nowhere - the end of which is only a few streets away (see the 'Misc' page'). 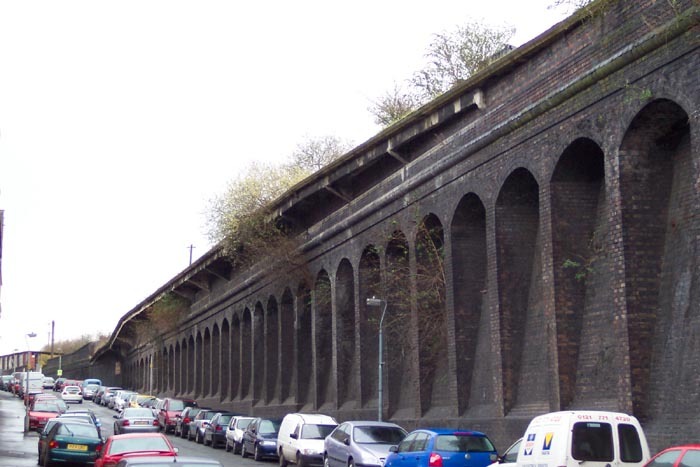 The only use the viaduct ever had was that this end of it housed cattle pens! Above-left we are in roughly the same spot but looking back towards the passenger station. The lines fanned-out here to run into the cattle station. 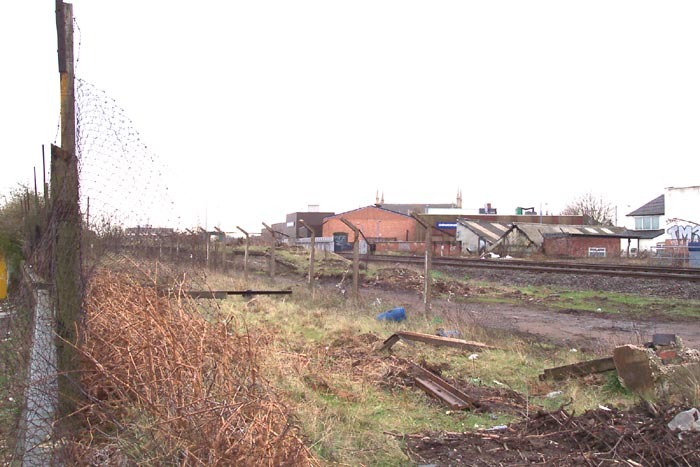 Above-right we are on the Moor Street end of the passenger station platform and have zoomed-in for a look at the cattle station site and we can clearly see the fenced-off site of the cattle station and, at the far side of that enclosure, the blocked-off entrance to the aborted viaduct. Above-left we are back out on Upper Trinity Street with the cattle station entrance behind us and to the left. 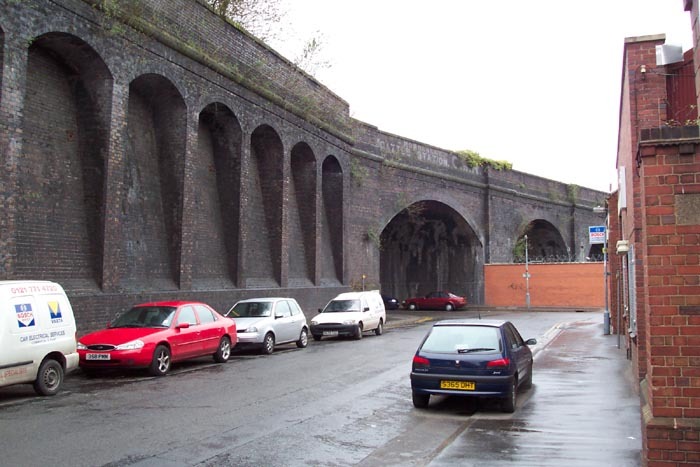 This shot shows the significant structure that supports the railway and, of course, what is actually seen here is the abandoned viaduct with a rather curious 'overhang', the purpose of which is not apparent. 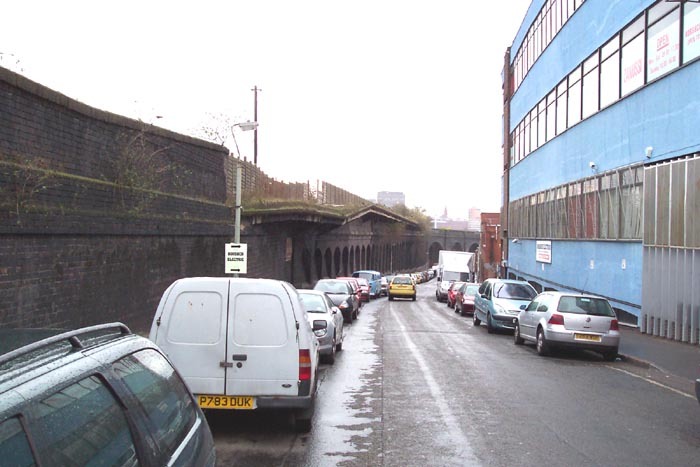 Above-right we have moved along Upper Trinity Street to near its junction with Adderley Street and, although not immediately discernible in the small photograph, along the top of the Adderley Street bridge is more signage from the railway's past. 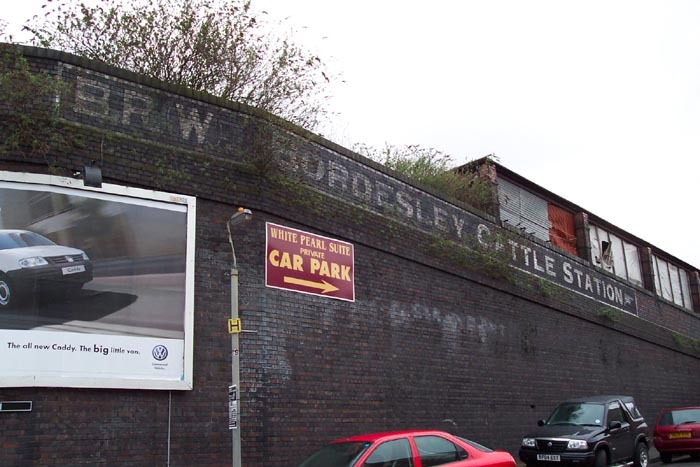 Above-left we are on Adderley Street and taking a close look at the signage on the bridge parapet: it is once more directions to the cattle station but this time from the GWR era which, as far as I am concerned, makes this a very interesting find indeed. Above-right we are looking back along Upper Trinity Street from the junction with Adderley Street. In spite of my original misgivings, this really is a fascinating site and requires further investigation as soon as I am able.